ASPNET Core Continuous Integration on Azure with Visual Studio Team Services. 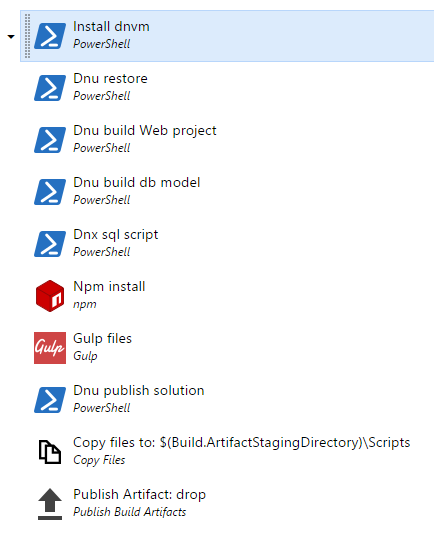 Alternative solution to Build and Deploy your ASP.NET 5 Application to an Azure Web App where error message The specified path, file name, or both are too long occurs. Not sure if you know, but the official approach provided by Microsoft to compile ASPNET 5 solutions and deploy to Azure via script doesn’t work. So far this is the current state. This is so annoying! I spent some time trying to circumvent this issue, with no luck. This is a OS limitation. Note: You could add Npm packages to the source code, so you wouldn’t need to have Npm installation as a task. I haven’t even mentioned about Bower packaging as a task, which you might be using. In my case I decided to add bower to the source code, just because it is so damn slow to restore packages during the build. Keep an eye on this post for more updates, as I’ll keep updating it when MS releases new stuff. Cloud solutions are becoming connected, multi-platform focused, so studying the SharePoint App Model itself is not enough to master, you need to know Office 365 Development APIs. Looking at the future, besides SharePoint having its own App Model, solutions are evolving, they are not limited anymore to what we can do within the platform.